OK, all of you come with me. We’re makin’ (vegan, gluten-free, almost raw) cheesecake. This cheesecake is inspired by my favorite cookie flavor, and one of my most loved cheesecake flavors. White chocolate and macadamia nuts were seemingly meant for each other, and I did my best to capture their perfect flavor pairing in this 10-ingredient cheesecake. The crust is a mixture of walnuts, macadamia nuts, dates, and sea salt. 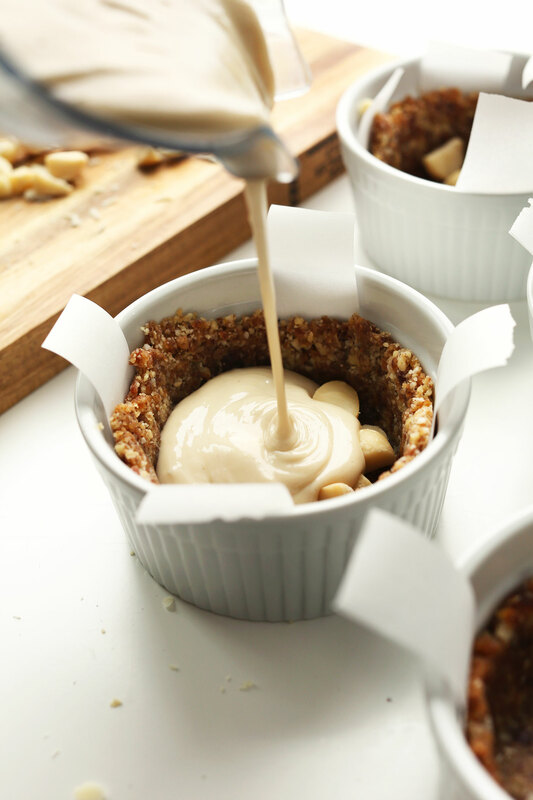 And the filling gets its creamy texture from soaked cashews, coconut milk, and olive oil. Plus, it’s naturally sweetened with maple syrup and gets that rich white chocolate flavor from cocoa butter – hubba. 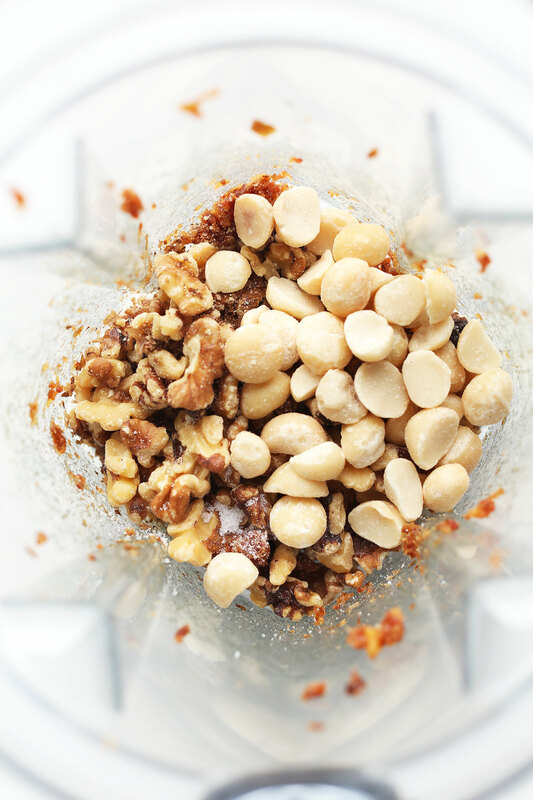 Throw a few macadamia nuts onto the bottom of the crust, pour in the filling, top with a few more nuts, and they’re ready for the freezer. These set surprisingly fast, and, thanks to cocoa butter, they can set out at room temperature without “melting” for much longer than traditional raw cheesecakes. 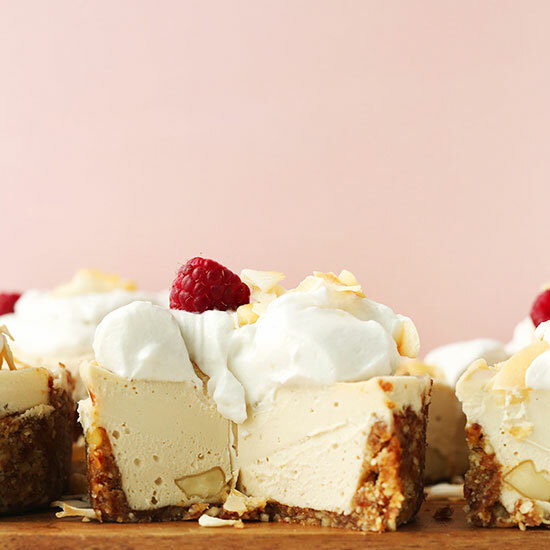 At room temperature, these cheesecakes are an absolute dream – super creamy and rich with tons of white chocolate macadamia nut flavor. If you so choose to accept the mission, upgrade them with the addition of coconut whipped cream, toasted coconut, fresh raspberries, and macadamia nuts. Then you’re looking at a little slice of dessert heaven. These would make the perfect cheesecakes to enjoy this spring and summer, especially for graduations, baby and bridal showers, and summer BBQs. Just keep them in the freezer to for maximum freshness, and let thaw before serving. Don’t forget the coconut whip! If you try these cheesecakes, let us know! Leave a comment, rate it (which really helps us out! ), and don’t forget to take a picture and tag it #minimalistbaker on Instagram! We’d love to see what you come up with. Cheers, friends! 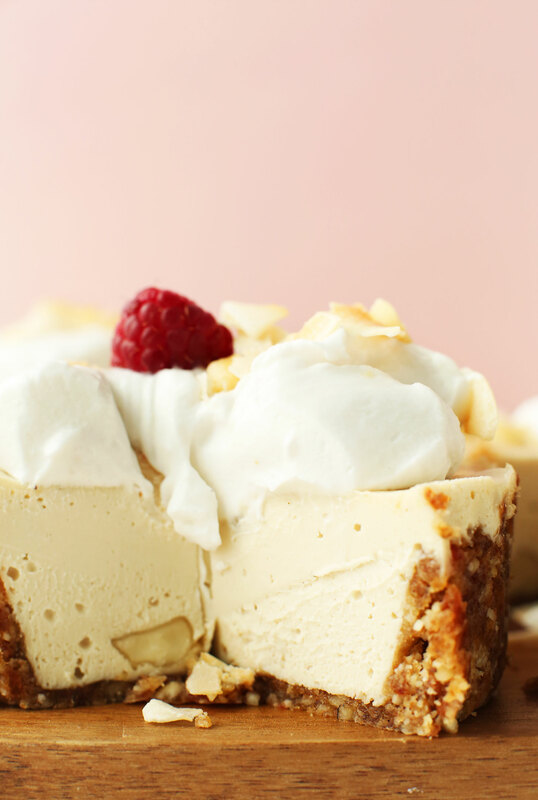 10-ingredient vegan cheesecake infused with cocoa butter and macadamia nuts. Creamy and rich center with crunchy macadamia nuts throughout. A naturally sweetened dessert that's created entirely in the blender! Soak cashews by adding to a small mixing bowl and covering with boiling hot water. Let sit uncovered for 1 hour. Next, add walnuts, macadamia nuts, and salt (optional) and process into a meal. Then add dates back in and blend until a loose dough forms - it should stick together when you squeeze a bit between your fingers. If it's too dry, add a few more dates through the spout while processing. If too wet, add more nuts. Store leftovers in a well-covered dish in the refrigerator up to a few days or in the freezer up to 2-3 weeks. *Adapted from my White Chocolate Lemon Cheesecake. Hmm, sounds like it’s something with your blender. If it’s a Ninja, that may be the problem. I recommend Vitamix or Blentec for best results. And are you sure your olive oil is fresh? That’s amazing!!! the taste, the texture… all is perfect. My son (4 years old) ate this cake last Summer and each time I ask him what to do for desert… he tell me to do it :) so we will eat that nut cheesecake for Christmas. Thank you for this recipe. Whoop! Glad to hear that, Marie-Eve! Hi may I know how long can this sit stable at room temperature? If it isn’t sit longer, can I use agar powder to make it longer stable? They can sit out for a couple hours at most! They can set out at room temperature without “melting” for much longer than traditional raw cheesecakes thanks to cocoa butter. Just made this last night. I doubled the recipe and used a springform pan. It came out beautifully!! I was surprised at how soft it was to cut right out of the freezer! The flavor is so amazing! I absolutely loved it! I have one of your cookbooks and have made quite a few of your recipes. They are so delicious and hope one day you can open a chain of restaurants. Great work Dana! Hello! This looks lovely, what size springform would you recommend to make this recipe into one cake instead of individual serving sizes? I just made this recipe and it’s sitting in the freezer and I am SOOOOO excited to try it! The batter tasted soooooo good. I am not serving it until tomorrow evening. After it sits in the freezer for 4-6hrs, do I pop out the individual cakes out of the muffin tin and put in the fridge until tomorrow? Or should I leave in the muffin tin and keep in the fridge until ready to pop out and serve? Orrrr do I leave in the muffin tin and keep in the freezer until ready to pop out and serve? Hi Suzanne! Either option will work really, but its up to you! My mom is allergic to walnuts is there another nuts I can use as an alternative? Hi! You could try pecans, almonds or hazelnuts! I love this one, made it many times in the summer, it is really a bomb of flavours! I know you would have to double the recipe but has anyone tried to make this as 1 large cheescake rather than the little single serving sizes. Would it hold up to being cut into slices or would it just fall apart? Update: I doubled the recipe and used a store bought gluten free pie crust. I did add extra lemon juice to give it more of that “tanginess” of a cheesecake. However, doubling the recipe was too much for the pie shell I had. I eat the extra filling that did not fit into the pie crust. It is as close as I can get to eatting a real cheesecake, I can not eat dairy. I was happily surprised at how good it was. My husband liked it too. I have not cut into the pie yet so I can not comment as to how well it will hold up once you start cutting. We haven’t tried this Sophie, but I think it could work! Please let us know if you give it a go! Did it work as 1 big cheesecake for you? Thank you!! I’ll double the recipe. Thanks for letting me know it worked!! Chris, Serious; get a life. If you are unable to execute the recipe and it really matters that to pick apart the name or have issues with BTW an amazing “cake”, like most civil people, you could offer a new name. OMG macademia nut! Can I change with another nut such as cashew? Lovely update. : never done at my home before.. sounds like a heaven treat..
Dana! I am trying to make this for a BBQ tomorrow and already bought all of the other ingredients, but can’t find cacao butter anywhere :( are there any substitutions? I found some cacao paste..would that work? Hmm, perhaps! But cocoa butter is best. I always find mine online! Does it matter which I use, cocoa butter or cacao butter? Sorry, it’s cocoa butter! Not cacao butter. will amend! This is my favourite recipe so far! I just loved it, I can’t believe vegan cheesecake can be so tasty, blew my mind, I’ll be making this again very soon! 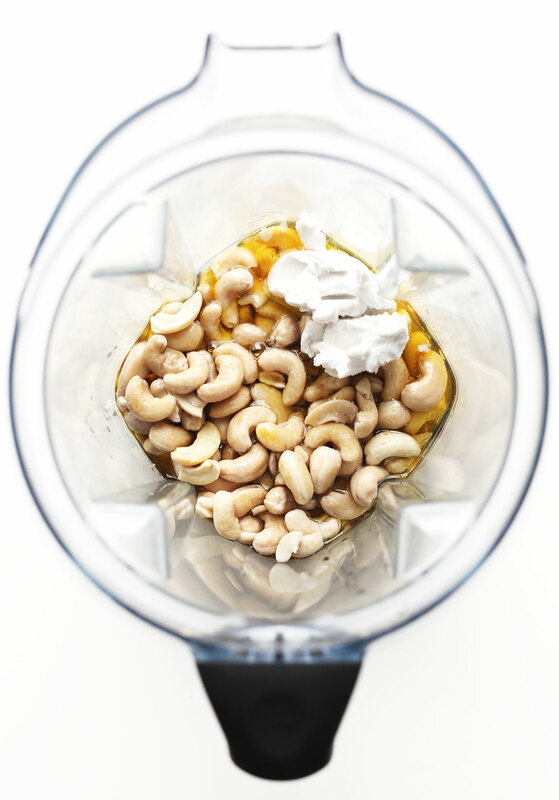 I’d love to try this recipe but my partner is very allergic to cashews! Other nut-types are fine, but because the cashews are a main ingredient in the filling I’m worried subbing it out for almonds or another type may ruin it ? Any suggestions/advice? Curious – does it absolutely have to set in the freezer or would letting it sit overnight in the fridge do? In my experience (which might be because of the products or tools I use, no idea), setting cashew-based cheesecakes in the freezer makes them grainy when thawed. I haven’t had any grainy experience freezing them, but this would one should set in the fridge. Just be sure to leave it overnight. The only concern there is that it will be much more difficult to remove from the ramekins if that’s what you’re using. So I would recommend a springform pan instead. Good luck! I was too impatient and already made them, haha. I popped one in the freezer for testing and pulled it out after a little under two hours – perfect! I’ll leave the rest in the fridge overnight to see how they’ll come out of the ramekin. This recipe rocks! I used wax paper in muffin tins, frozen for 4 hours, came out stellar. Thank you!! II made this today. I had my dad for Pentecost lunch and we had a chili first, and then a cup of tea and one of these after. My dad loved them and so did I. If anything wrong with them, it would be, that they’re SO filling. Almost a meal on their own. I might try and make them smaller than the ramekins next time. I scaled down the portion for just two persons (ramekins) and that worked just fine. I was wondering if it would be possible translating it to Danish and posting it with link back to you? Anyway I love your recipes and the site which will be an inspiration for my own foodblog which is in the making. Have a nice weekend. By this stage I am all yours now. I didn’t really like raw cakes before, they all seemed to be just so boring, and I’ve never had any idea on how to make one myself. Aha. This sounds awesome . Yummy recipe . Will get my kids review by today itself. ??? Sorry for my mis type. Coco butter is what I meant instead of coconut butter. Anyhow after reading some of the comments, looks like I would have to use the Coco butter to get the white chocolate flavor. I am also curious if there’s a substitute for cocoa butter? When I clicked on that amazon link it just seems really, really expensive. What else could have that level of substance? Could I use coconut butter? I bought cocoa butter intended for skincare, but it said 100% cocoa butter, so I used it. It was only 7:50 for a small jar and it turned out very well. I will be eating a version of this on my birthday next week. Any cashew substitute suggestions? As someone who’s low fodmap, I’m trying my best to avoid these.. Can I use soaked macadamia instead? Anything with white chocolate, you got me. 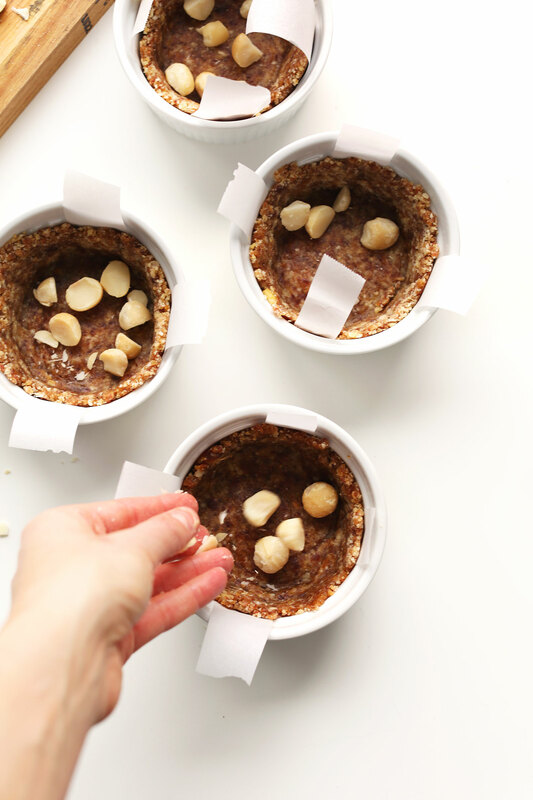 You know I’ve never even made cheesecake, let alone a Vegan, healthier version! Do you reckon this could be my first?! It looks and sounds so delicious and actually, pretty damn easy. Now I need to create an occasion for 7 other people to join me as we gorge on this, or is it acceptable to just eat several in one sitting…. Probably best not do that! Time for the next cheesecake type! I thought I’d never have cheesecake again and now I already made two of yours… It’s a real cheesecake extravaganza! This look amazing! I cannot wait to try it soon! These look SO rich and decadent. I hate white chocolate, but I did try the Lenny and Larry’s white chocolate macadamia cookie and it was actually quite delicious! That texture looks incredible! I always huge to be a sucker for the huge macadamia nut cookies at Subway… I obviously no longer go for that anymore! Why would I even need to with delicious vegan desserts like THIS?! I had been searching searching for a gluten and dairy free recipe to make for a friend’s birthday. This was perfect. We opted for coconut oil and a sprinkling of toasted coconut on top. If I hadn’t made it myself, I wouldn’t have believed that it was dairy free. It was perfect! 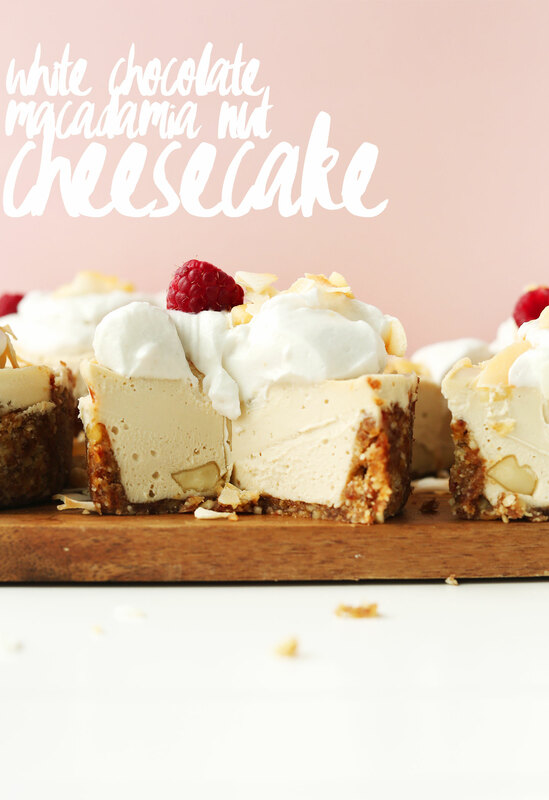 I love white chocolate macadamia nut cookies, but never thought of a cheesecake! Going to have to try this! I am always confused when a recipe has coconut milk, coconut cream, coconut butter. Would you mind explaining each if possible a picture of each. Thank you. Cocoa butter is for chocolate flavor and helps with “setting” and creaminess. Coconut milk helps thicken and blend the cashews. But what are they? I understand what they are for but when I think Coconut milk is that from a can, a bottle, is it shelf stable or refrigerated, etc. Is Cocoa butter found in the refrigerated section, shelf stable? etc. I don’t even know what to look for these things and coconut cream where does one find that and what to look for…my plight is not how to use them, I get that but how to find them, where to look. Thank you. I’m not sure off the top of my head where you find cocoa butter. Coconut milk can come in many forms in the store, shelf stable in a bottle(lower fat, think almond milk), canned (lite and full fat) usually in the ethnic section, coconut cream is canned in the store as well usually located by the canned coconut milk. It is the solidified fat from coconut milk. There are some resources online as well to show you how to get coconut cream from a can of coconut milk. Hope that helps! The food grade cocoa butter I was able to locate (after combing the city) was found in a health food store called HSU in Columbus, Ohio- not sure where you live or what you have access to, however it can also be purchased online. The brand I was able to locate was called NOW Solutions, it came in a white, plastic screw top container and it was being stored on a self with other skin care items, not in a can or refrigerated. It is shelf stable. It was $9 for a 7 0z container. Pricy stuff. Don’t wait until the day of the event to attain the ingredients OR to even begin to make this cake. In spite of the minimal ingredients, this is a complicated preparation. If you have to order the components online, your planning needs to include that reality. Just preparing and shaping the crust into the 4 individual pie tin/molds I had planned to use, took me an hour. In addition, the crusts at the thickness I used, were not strong enough once they came out of the freezer to hold the filling with toppings standing alone once room temperature was attained, so I would plan to just serve them in ramekins. I would also choose to use less of the cocoa butter as it has a bit of a wax flavor to them I felt was too much. Goodness, this looks delightful — I am definitely going to surprise my partner with this! So many recipes call for Coconut Cream/Butter/Milk/etc, but I have been staying away from canned foods due to the presence of BPA and buying the stuff in glass jars can be prohibitively expensive. Thankfully it seems easy to DIY with a blender and a bit of patience, though I have yet to try. But once I get it down (and source some local coconuts), I will certainly make this recipe along with many others (eg. Vegan Ice cream — Yum)! Ok, YES! When I think of cheesecake, I never ever even consider a vegan version. This recipe is top notch! !